Why aren’t cushion plants always the best facilitators? Consequences of eco-evo processes in alpine systems. In recent decades facilitation in plant communities has moved from being largely neglected to a well-established phenomenon (Brooker et al. 2008). However, the simple picture of greater facilitation in stressful environments is gradually fading. Not only does abiotic stress change along environmental gradients, facilitators change too. 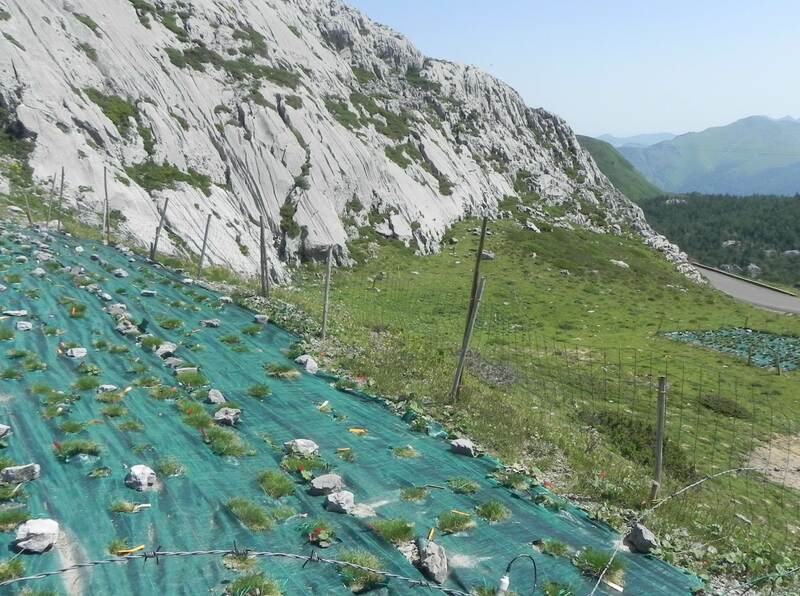 It appears that foundation species such as cushion plants in alpine systems vary in their growth form along environmental stress gradients and exert different effects on subordinate species occupying the cushions (Michalet et al. 2011; Al Hayek et al. 2014). Do cushion plants respond plastically to environmental variation or do they locally adapt to different environments? What are the consequences of plastic and heritable growth form differences for the species attempting to establish inside these cushions? Al Hayek et al. designed a clever reciprocal transplant experiment to resolve these questions and focus on the interface between ecological and evolutionary processes. The two experimental sites (convex site on the left, and concave site on the right). They collected distinct individuals of Festuca gautieri from two microhabitats in a subalpine community – tight cushions from dry convex outcrops and loose cushions from wet concave slopes –propagated them in common conditions and reciprocally transplanted them back to convex and concave microhabitats in adjacent common gardens. They found that plants collected from different habitats were morphologically distinct after four years of propagation and grew best in their home environments, suggesting that tight and loose growth forms reflect local adaptation to high-stress and low-stress microenvironments, respectively. However, plants were also highly responsive to their environment and showed plastic changes in multiple traits, towards tight growth forms in high-stress and loose growth forms in low-stress common gardens. Thus, variation in cushion growth form along the stress gradient reflects both heritable differences and plastic responses. 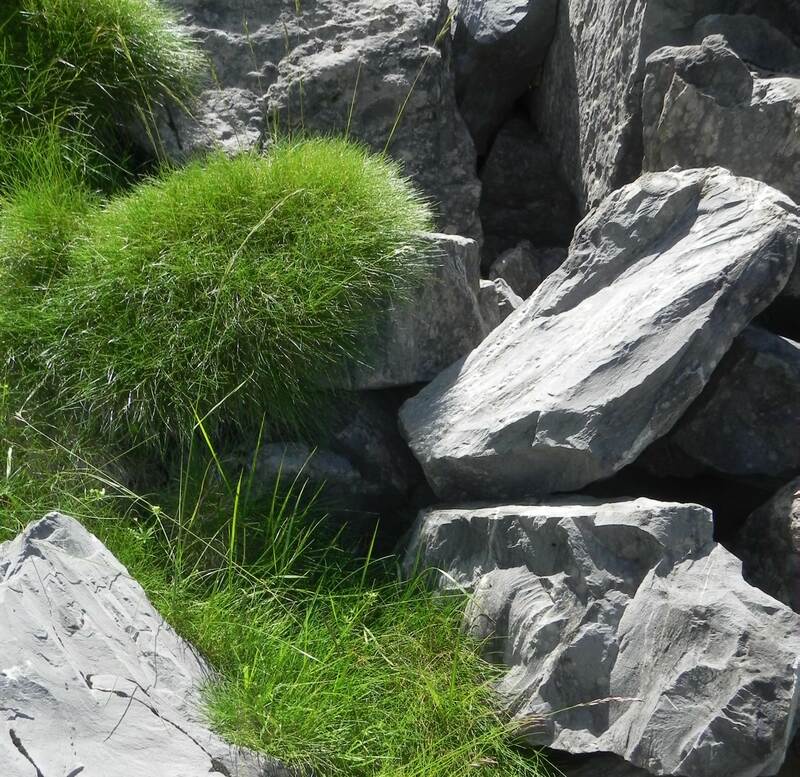 The two phenotypes of Festuca gautieri in their natural habitats at La Pierre Saint Martin (Atlantic Pyrenees, France): tight cushion in rocky convex topography (upper cushion) and loose cushion in concave topography (lower cushion). The results also showed that a high-stress environment generally reduces plant growth and shifts interactions from competitive to facilitative, but it also selects for compact growth forms in facilitators. When seedling survival and richness of establishing subordinate species was examined, it was the loose cushions that showed a facilitative effect on seedlings, while the tight cushions, which are typical of high-stress microenvironments, generally suppressed seedling establishment. In other words, subordinate seedlings get the worst facilitators when they need them most! This raises a question regarding the driving force behind selection for tight growth forms in high-stress habitats. Is it merely due to selection for avoidance of drought stress? Could a tight growth form also be a result of selection for reduced facilitating characteristics and an enhanced ability to physically preclude the establishment of potential competitors? These are not all of the thought-provoking results that Al Hayek et al. have uncovered. Read on to learn more. Al Hayek, P., Touzard, B., Le Bagousse-Pinguet, Y. & Michalet, R. (2014) Phenotypic differentiation within a foundation grass species correlates with species richness in a subalpine community. Oecologia, 176, 533–544. Brooker, R.W., Maestre, F.T., Callaway, R.M., Lortie, C.L., Cavieres, L.A., Kunstler, G. et al. (2008) Facilitation in plant communities: the past, the present, and the future. Journal of Ecology, 96, 18–34. Michalet, R., Xiao, S., Touzard, B., Smith, D.S., Cavieres, L.A., Callaway, R.M. et al. (2011) Phenotypic variation in nurse traits and community feedbacks define an alpine community. Ecology Letters, 14, 433–443. September 2, 2015 in Announcements, Author post, Editor's Choice.